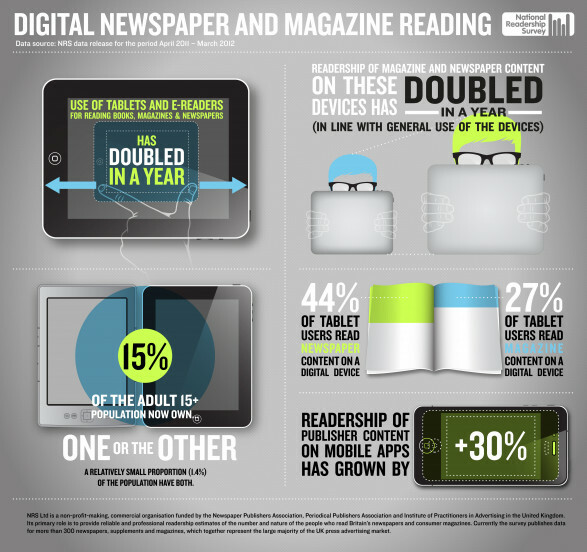 No surprise, perhaps, but we’re reading more on our mobile devices. I’ll dub it The Infoslab: A decision device. Where you get headlines, stock reports, messages and all of your valuable information in one place. But perhaps what’s surprising, illuminated by this infographic below, is the modest adoption rates of tablet devices, which in turn cultivate modest rates of content consumption on such devices. It’s early days to some degree. Would love to see a comparison of the adoption ramp between PCs back in the day and tablets today.